…and this stage is definitely the world!! Well, at least for me… If you are a fan of theatre, and if you speak German, this theatre is a must! The building from 1913 is more intimate than its “big sister”, the famous Burgtheater. Nevertheless about 500 people fit into the beautiful grand auditorium, all decorated in gold and red, though kept kind of simple. 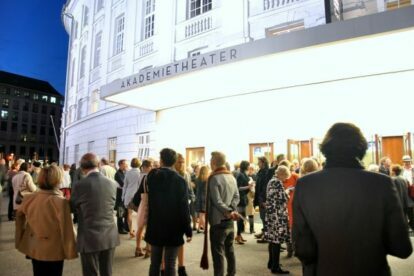 Akademietheater is the place to enjoy great actors like Birgit Minichmayr, challenging productions and plays like “Der Goldene Drachen”, some of them have won well-deserved prizes. An evening there is much more than pure entertainment! Another good thing: if you are on a tight budget, but willing to suffer a little for arts, there is standing room for a very cheap price. But be aware: opening nights and new productions are sold out early, so check out the website with lots of good information. A small note: there is an English theatre as well in Vienna’s 8th district, but for my taste they show very “old-school” plays, so alas you poor fellows should learn German to enjoy the great theatres of Vienna.